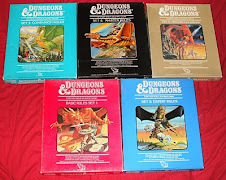 Some may be frustrated that Blackmoor appears so differently in the versions presented by Arneson from what is seen in Greyhawk or Mystara material and elsewhere. On the other hand you could also see this as three or four different sources to steal ideas from for your Blackmoor campaign! My interest in Greyhawk's Blackmoor has been sparked again by various blog posts such as Mortellan's interview with map maker Rob Lazaretti. I went ahead and dug up an old discussion at the Comeback Inn on Fred Weining's take on Blackmoor which has become very influential on how Blackmoor has been presented in Greyhawk material over the last decades. The little differences are as intriguing as the countless similarities between the different versions. Ramshead has become Ramsgate. The Peshwah have become the Wolf and Tiger Nomads. The Afridhi have been replaced by Iuz. The Duchy of Ten is now the Duchy of Tehn and has been placed in a very different place compared to where Arenson assumed it was. Ripvanwormer made some excellent suggestions on how to compare the different settings in this discussion we had ages ago. I have merged Blackmoor's and Greyhawk's Blackmoor into one place. Yeah, I am a heretic I know, but I like how they are a common place in both systems. I am going to link to this from my Msytoerth page. Thanks for the nod, Havard. Yeah in case anyone missed out, that (doctored) map comes from Wolfgang's two part Dungeon adventure, the first which was called Raiders of the Black Ice. It's among my favorites as it gave me an excuse to run something in Blackmoor. There is more to Lazzarreti's map if you can get a hold of it. I cropped a bunch out including the Tusking Strand and more. Tim: Thanks for the linkage! I am tinkering with the idea of including some of these Greyhawk specific Blackmoor locations to my Blackmoor as well. I agree that Wolfgang Baur did a great job with those adventures and really gave Greyhawk-Blackmoor some much needed attention. Although my Greyhawk campaign players do not know it yet, I have put a very Arneson Blackmoor in the Blackmoor location of Darlene's map. However (and this might be totally appropriate, I really don't know) it is a deeply Lovecraftian/CAS kind of place, and the City of The Gods' technology is all represented by Giger paintings.